The Praxis Middle School Science 5440 covers ALL the info a beginning science teacher of ALL middle school grades should know. That’s a lot of content! How can YOU be prepared to pass? Wherever you are in your teaching career, you can pass on your first try! Just follow these five steps. Go to ETS’s (Educational Testing Service) Praxis Middle School Science 5440 Study Companion. This part is as simple as ABC! Print out the detailed 7 1/2-page Praxis Middle School Science “Test Specifications” section. This tells you everything you could find on the test. From variables to entropy to photosynthesis to black holes, there is a LOT of information! Read the ENTIRE printout! As you read, ask yourself which parts are a problem for YOU? No matter what your science background, you need to highlight the sections you’ll need to study to pass. 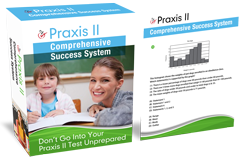 The blueprint + YOUR needs will help you decide on the best Praxis Middle School Science study guides and practice tests. Once you know YOUR needs, look for Praxis 5440 Middle School Science practice tests and prep books that match those needs. Use only current Praxis Middle School Science study guides or practice exams. Make sure the Table of Contents matches the current 5440 exam. Look for review guides or sample exams that allow you to practice taking the Praxis Middle School Science. Check the Table of Contents AND page through to make sure the Praxis Middle School Science practice questions match your blueprint. Read the full answer explanations in the practice tests you use. Read for typos, wrong answers, or explanations that are not clear to YOU. Look for 5440 Praxis Middle School Science practice exams or flashcards that explain why answers are correct AND incorrect. Use the highlighted sections of your test blueprint to find difficult questions and their explanations: do you understand them? Read online reviews for Praxis Middle School Science study guides and practice tests for pros and cons. Use your instincts: no one else can tell YOU what works for YOU. Don’t end up with Praxis Middle Science Test study guides or sample tests that don’t help YOU. Spend the time to get the right preparation resources for this high-stakes test. You’ll never regret getting the best study tools to help you pass on your first attempt! Set up a daily schedule of small chunks of time (20-40 minutes). Don’t cram! It just doesn’t work! Leave time between Praxis Middle School Science practice exams (usually more than one day). Give yourself TIME to understand the explanations of the correct and incorrect answers for the practice questions. Focus study time on Praxis Middle School Science test content areas and terms you do not know. You may feel good when you know the answers; work on the answers that you need to learn! Practice the pace as well as the actual questions on your exam. There’s 150 minutes for 125 questions on the Praxis 5440. This is scientific! Ask: what slows you down? Is it content? Types of questions? Similar answers? Look for reasons WHY you choose incorrect answers: is there a pattern to the choices you make in words or phrases? Not only are you learning information, you are learning how to take the Praxis Middle School Science test! Remember: on the actual Praxis Middle School Science test, wrong answers DO NOT count against you! When in doubt, narrow your answers as much as possible, then make your best guess! The actual test offers you 2 ½ hours to answer the 125 questions. YOUR 125 answers determine whether you will be certified to teach Middle School Science! One week before you take the actual test, take one last Praxis Middle School Science practice test. Again, set up a time and place with no distractions. Use the same procedures as the actual exam. Research shows this last test—and its timing—can boost your score! Don’t wait! Take these five steps now. If you follow them closely they’ll lead you to pass-the-Praxis Middle School Science on your first or next attempt!